A delightful twist of chicken fingers on top of rice, coated with a thick mushroom and cheese crust that's lightly browned and crisped to perfection. This is a really nice alternative to making sinangag or fried rice when you have lots of leftover rice from last night. Featured previously on SM Master Chef's Cooking Marathon, I decided to give each recipe another chance at the limelight. Deep fry chicken fingers in oil until golden brown. Drain on paper towels. Place cooked rice on a baking dish and top with chicken fingers. Pour condensed cream of mushroom over chicken. 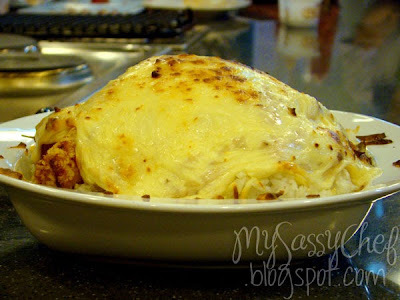 Baked until cheese is melted and slightly browned and crusted. Need some serious sugar fix? 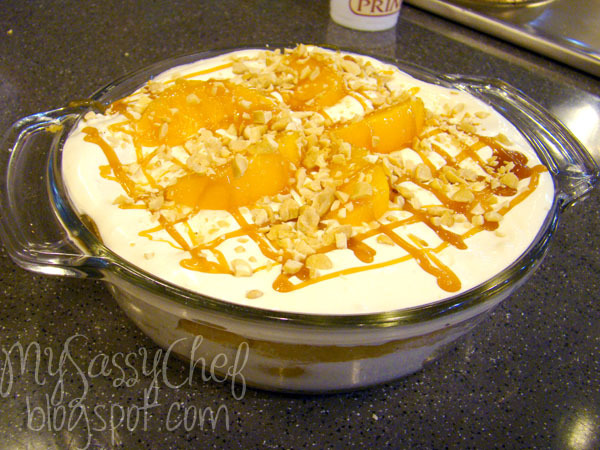 Try some chiffon cake layered with whipped cream, caramel, peaches and nuts! Who doesn't love peaches and cream anyway? This one's definitely going to satisfy anyone's sweet cravings. Yummy, a bit too sweet for some, but definitely good for the soul. Whip 2 packs all purpose cream until soft peaks form. Chill until ready to use for frosting. To make caramel, combine sugar and water in a small pan. Do not stir. Cook over medium heat until sugar is cooked and has turned amber in color. Quickly pour in cream and stir vigorously. Cook for another 2 minutes. Remove from heat then add butter. Set aside to cool. To assemble, divide the cake into two slices horizontally. Place a layer of cake on the bottom of a trifle bowl. Spread caramel over the cake then top with whipped cream and slices of peaches. Repeat the process to the second layer. Lastly, frost top of the cake with the remaining cream. Garnish with nuts and peaches. Many of us Filipinos have friends and relatives overseas. Whether they are working there or migrated for good, they have always been sending us treats and pasalubong from their countries. Just recently we received another Balikbayan Box containing a lot of imported goodies, and I realized that most of the time we just send them our thank yous through email, and video chat programs. Let's face it, shipping a box to another country is very much of a hassle here in our country, not to mention a lot of unnecessary fees to be paid. When I stumbled upon Wine.com from an advertisement I saw, I thought I found a solution to my problem. Since my relatives love social gatherings and sipping wine along with sharing stories, I chose to go over the Wine Baskets selection of the website. 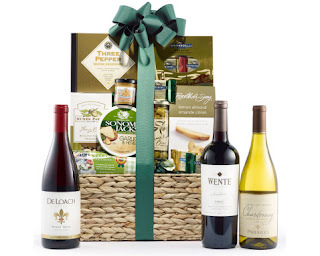 While everything looks great, I chose the California Wine Tour Wine Gift Basket (pictured above) and the Tuscan Trattoria Italian Wine Gift Basket below. The first one has nuts, olives, chocolates and meat to perfectly match the wine, while the second gift basket has all the ingredients needed to make one classy and romantic Italian dinner. 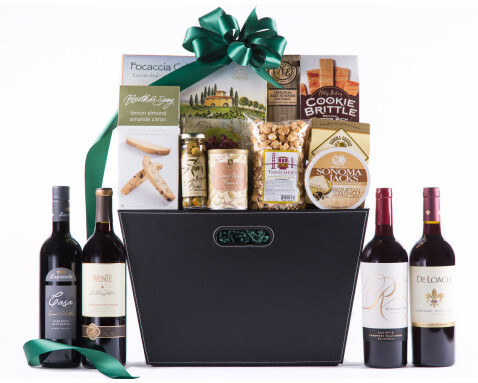 Who doesn't love premium wine, classic Italian pasta, and chocolates for a gift? My cousins received the gift baskets within a week's time from my ordering and they loved the surprise on their doorstep. They particularly raved about the DeLoach Heritage Reserve Chardonnay from the first gift basket. At under $200, these two elegant wine gift baskets were worth sending them. To be able to purchase from them, you have to create an account with them first, and be able to pay through credit card. I used the Facebook sign up button to make things easier. My experience with wine.com will certainly not stop here. There's something with Filipino-style breakfasts that never fails to wake me up even after staying up late from last night. There's daing, those wonderfully tasty salted and dried fish, and tapsilog which goes extremely well with spicy-sweet vinegar. 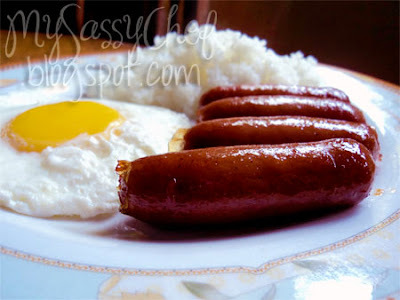 And then there's tocino and longganisa, two favorite breakfasts in our home, but seldomly served because we're trying to cut back on our fat consumption, and everyone knows that commercially bought tocino and longganisa are laden with chunks of fat and lots of sodium, and processed in a way that defeats the essence of traditionally prepared ones like my mom used to make. 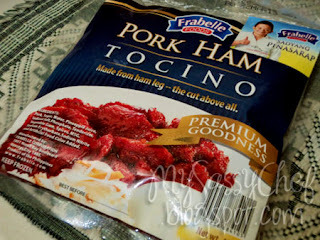 But it's not that bad to have them occasionally, and I got the opportunity to review one of the new names in the processed meat industry. I have featured Frabelle Foods in my previous post, and it's about time I put their claims to the test with our longganisa, tocino, and poached eggs breakfast. Their Longganiza Hamonado was surprisingly mellow in taste, so if you're used to eating too salty foods then at first it may give you an impression that it lacks taste. It's sweet with just the right amount of salty, peppery flavor that's not cloying at all. It has a distinct smoky taste, which went well with the poached eggs, and it doesn't have huge chunks of fat you normally see in other longganisa. 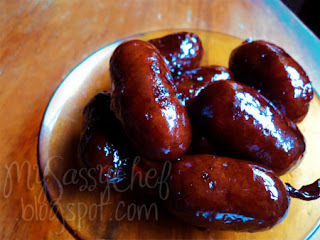 Their Longganiza Recado, on the other hand, packs a stronger flavor that's garlicky, peppery, and a little more salty. 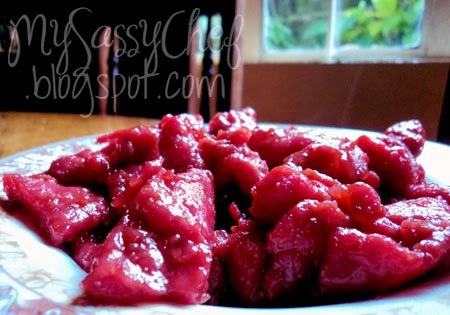 It also contains small visible chunks of fat, and turns out with a sticky coating when cooked. There's also some notes of smoky flavor, but not too much, which makes you eat a few more pieces to have it linger in your mouth. In terms of preference, they both taste great, almost as good as those we buy from the provinces, but of course still not quite the same.